Swindells roofing are constantly striving for new methods to keep our company at the cutting edge of the construction industry. Whilst some clients require traditional means of roofing, Swindells roofing also implement low maintenance dry fix systems. Whilst eradicating the use of mortar this cut downs maintenance issues and speeds up construction time. 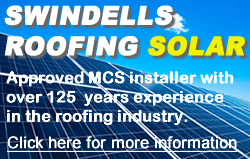 Swindells roofing implement an environmental policy. ‘Carbon footprint’ is a heavily discussed subject at the moment and in recycling all of our waste created, we have cut down our carbon footprint dramatically over the last couple of years. We are able to offer the installation of Marley Eternit Eco-logic tiles. This unique tile absorbs Nitrogen Oxide, therefore improving air quality. Additionally the Eco-Logic tile is made from around 50% recycled materials making it one of the most environmentally beneficial and sustainable roofing products on the market today. The current financial climate has seen a rise in theft of materials with a re-sale value as scrap. We offer a number of ‘lead free’ options to eliminate this problem.